I am beyond impressed with LittleSnowflakes. This great little Etsy shop offers cakes, cookies, candies, and more. Everything looks absolutely delightful. The pictures on the site are beautiful, the descriptions are mouth watering, and the shipping prices are quite reasonable considering these are perishable items. I can say first hand that the pumpkin fudge is scrumptious! It would make a sensational gift during the upcoming holiday season. I am seriously thinking of ordering some around Thanksgiving to serve my guests. It is not all sugar with no flavor, like many fudges I've tasted. This is smooth, creamy, and has an lovely pumpkin pie flavor to it. 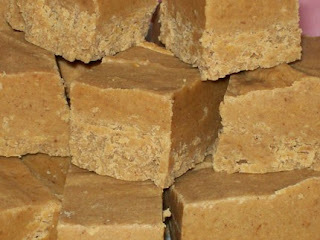 I am a huge pumpkin fan, so this yummy fudge was a hit with me! There is something in the shop for everyone. My neighbor Lynette and I are both trying to lose some weight, so the black bean brownies would be perfect for us. 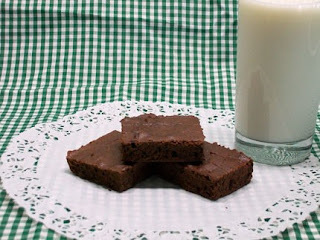 Each brownie has only 3 WW points. You get two dozen in an order, so that's 24 yummy servings at only 3 points each. Sounds like a not so naughty way to indulge a bit. She also offers Chocolate Chip Cookie Dough truffles. Do I even have to explain why I think they sound amazing? Seriously, go look at the picture and tell me you don't want these things. They would totally blow all my dieting plans! LittleSnowflakes offers quite a few muffins, Love Notes fortune cookies (these would make a fantastic gift! ), and brownies. Dan is dying to order the Chipotle Brownies. I really urge you to check out this wonderful Etsy shop. Order her treats as gifts. Order them because you need a yummy, indulgent, snack. Order these wonderful creations so you don't have to make a single sweet all holiday season. Or just order some because of how spectacular they look and sound. I promise you will not regret it. At the very least, stop by LittleSnowflakes, browse around, and let them know I sent ya! Yum! Now you have me craving FUDGE! 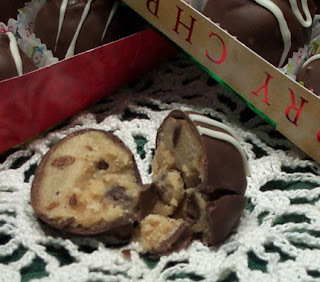 Cookie dough truffles?! I'm in! etsy is the best! I find the most amazing things on there. Love your blog! hi there! i just sent you an email about the comment you left @ my blog. thx for coming by, thais.